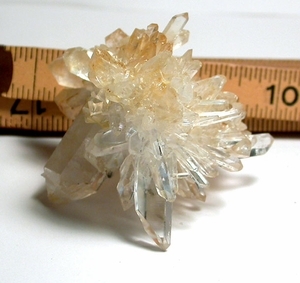 FINE golden healer quartz burr cluster from the Collier Creek Mines is a real WOW for your small cabinet collection. Crystal clear points to a 2" doubly-terminated crystal include rare needle points, record keeper, uncommon 7h faced, rainbow, and twin. Pointing in all directions, 2-3/4"x 2-3/4"x 2-3/4", there is natural contact and regrowth but amazingly just one chipped crystal and one missing one. Much better than even we could have expected!